I have previously reviewed AKC/WKC's competition style kettlebells. They are officially called "VF Prograde Kettlebells", and are available at the World Kettlebell Club's store here. In two previous reviews in December and June of 2009, I found them to be of very high quality, and to be the "best buy" in competition kettlebells on the market. I have also compared their bells to those sold by Perform Better, and later learned that Perform Better had been selling WKC Prograde rejects as their own competition bells. I documented that discovery here. Perform Better has since changed the competition bells that they offer. Officially known as "First Place Competition Kettlebells", these kettlebells now come with the handles pre-stripped so that the athlete will not have to strip the handle with a file and sander or other tool. Another benefit to the consumer is that it will be obvious if the handle contains multiple imperfections that could tear his hands. A manufacturer or dealer cannot hide the imperfections with bondo and paint on a stripped and polished steel surface. Since Perform Better instituted these changes, their competition kettlebells have become popular with kettlebell sport athletes, and many recommend them. Recently my wife and daughter have expressed an interest in kettlebell lifting, and asked me to order them one to share. I decided to order one of Perform Better's 8kg models, and report my findings. 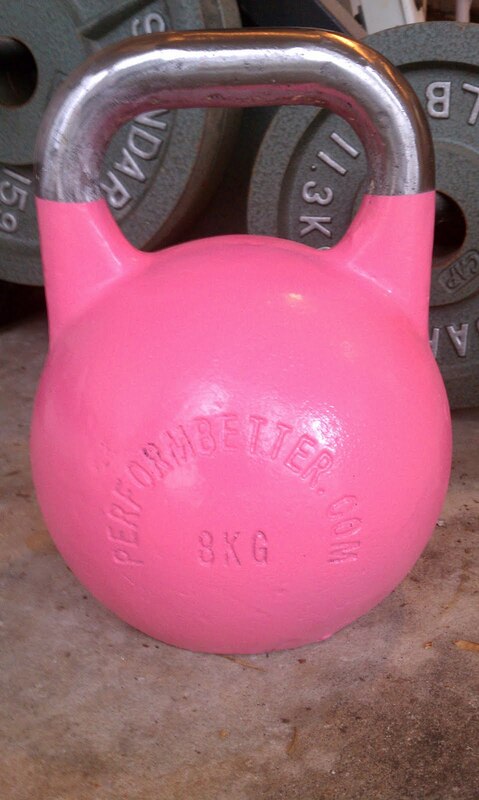 Notice that Perform Better's website is cast into the kettlebell. This bell is an obvious improvement over PB's last offering. However, I noticed a number of imperfections that indicated painted-over repairs. 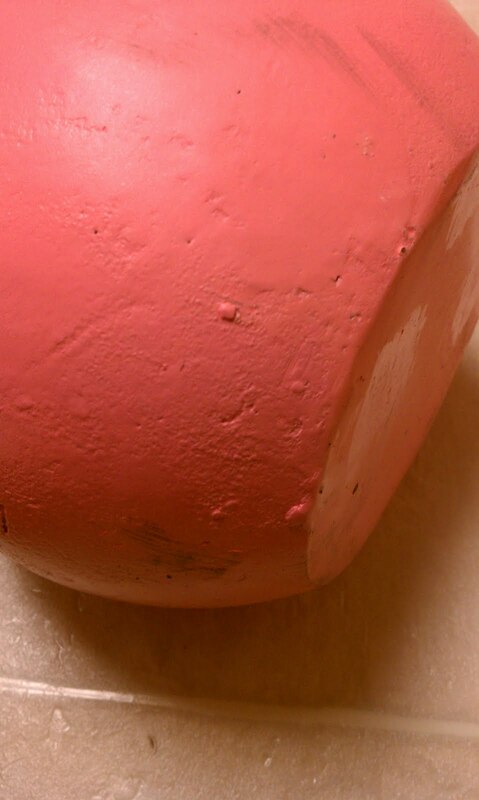 Note: the marks that look like scuffs on the bell are not scuffs, but are places where the paint was not completely and evenly applied, and part of the bell was not painted at the factory. Basically, the paint job is really shoddy. What to think? Well, I was shocked, honestly. Perform Better has an excellent reputation. They send confirmation of orders quickly, and ship promptly. I have heard of anecdotes of other consumers who have been very pleased. But this is the second time I have ordered a kettlebell from them, and the second time they have sent a substandard product. It's troubling to me that this happened, especially since the last time I told them they sold me a competition bell that was not suitable for competition, they replied that I should not have taken the finish off the handle in order to use it, and would not offer a replacement or refund (I wonder if they know I figured out their secret about where they were getting their bells and why they covered them with so much bondo and epoxy?). Back then I tried to explain that competitors have to strip and sand the handles if they actually want to compete with their product, but they denied that. Since then, as I said, they only sell bells with handles that are pre-stripped. So what's the bottom line? From what I can tell, the defects in the bell won't be an issue unless we use the bell for double kettlebell lifts and the paint and bondo get knocked off when the bells clang together. I doubt that will be a problem. I bought the bell for my wife and daughter, and even if they want to use it to train to reach reach Rank IV or III with the WKC, it won't hinder them. The real problem is that defects like this don't leave a good impression, especially when you have received two in a row. Perform Better and WKC seem to be in a perpetual pricing war (maybe that's just my impression). But it varies day to day which company is offering the lowest prices on kettlebells. The day I ordered this bell, I think it was $10 cheaper than the WKC's. The AKC/WKC VF Prograde Kettlebells are some of the best you can buy, and are by far, the best for the money. Great review David, thanks for posting. I am always tempted to strip down my (non-PB) bells, but it scares me what I might find. And your daughter's doing well to be racking the 8kg! By taping over cavities the kettlebell business has reached a new level. In every case, I hope the that the young girevika stays happy with the bell. Nice pic! Thanks, Ian and Alexander. Hope you guys are well.